The Bureau of Meteorology (external link) provides overview maps of Victoria’s monthly and annual rainfall and other relevant information. These maps are based on long term averages and developed using an analysis program which estimates climatic values between recording stations based on factors which influence rainfall and temperature (eg., altitude, topography). The climate of Victoria is characterised by a range of different climate zones, from the warm, dry Mallee region of the northwest to the alpine snowfields in the northeast. Median annual rainfall ranges from less than 300 mm in parts of the Mallee to in excess of 2500 mm in the wettest parts of the mountainous regions. The highest recorded daily rainfall has been 375 mm at Tanybryn in the Otway Ranges, this was measured in the 24 hour period to 9am 22 March 1983. This recording was considerably higher than the next highest, 275.1 mm at Nowa Nowa (Wairawa) on 11 March 1906 and 274.6 mm at Balook on 18 February 1951, located respectively in East and South Gippsland. The highest rainfall accumulated in a calendar year has been 3738 mm at Falls Creek (Northeast Victoria) in 1956. On a seasonal basis, rainfall over the central and southwestern areas of Victoria is at a maximum in late winter and early spring, and a minimum in summer or early autumn. A winter maximum and summer minimum rainfall is also evident over northern Victoria and the northeast. East Gippsland, which is sheltered by topography from both the wintertime cold fronts and the rain-bearing northwesterly winds that produce precipitation over the ranges, does not display as marked a seasonal variation in rainfall. There is also considerable variation in rainfall from year to year due to the natural variability of the weather. Large bands of cloud which stretch across the continent from the northwest bring moderate to heavy rainfall to the north of the state in some years. Low pressure systems off the east coast are responsible for heavy rainfall events in East Gippsland. These events may bring rainfall in excess of 100 mm in 24 hours. Rainfall in the remaining southern areas is more even, with cold fronts regularly bringing showers. Thunderstorms also contribute significantly to the total rainfall, particularly in the spring and summer months. The median annual rainfall in Victoria varies considerably from greater than 1800 mm recorded in parts of the Otway Ranges and Eastern Highlands to less than 300 mm recorded in the Mallee in northwest Victoria. In general, the areas with highest rainfall are associated with higher elevations. In the Otways and south Gippsland, high rainfall can occur at modest elevations because both these areas are frequently exposed to moist air streams. Rainfall occurs more frequently in winter than in summer. In summer, substantially more uplift is required for air to reach saturation and produce cloud compared to in winter. However, because of the higher moisture content of warm air, summer rainfalls may be much heavier. South of the Great Divide, the amount of rainfall produced by frontal systems gradually decreases eastwards, with the result that East Gippsland gets little rain from this source. The relatively lower annual rainfall around the Gippsland Lakes is caused by the lack of penetration of moist south-westerlies as well as failure of low pressure areas (which bring rain to the eastern parts of East Gippsland) to extend further west. Over inland Victoria, a significant proportion of the rain is from bands or areas of cloud that are transported across Australia from the northwest. Falls can be particularly heavy when these northwest cloud bands interact with eastward moving frontal systems that cross the Southern Ocean. 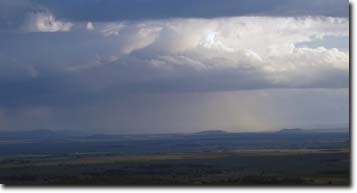 The frequency of these cloud systems and the amount of rain associated with them varies from season to season. In the far east of Victoria, the weather is less influenced by weather patterns originating from the Southern Ocean. The Eastern Highlands have produced a rain shadow which forces moisture laden air to rise, depositing much of the rainfall on the western slopes rather than the eastern slopes. The topography plays a considerable part in increasing rainfall in some areas, such as the Otway Ranges where sloping valleys funnel moisture laden clouds. The higher peaks of the northeast ranges and the western slopes of the Otway Ranges, experience the highest mean annual rainfall in Victoria, with falls in excess of 2500 mm and 1900 mm respectively. The Otway Ranges produce a distinct rain shadow to the northeast, with markedly lower average rainfalls between the ranges and the western side of Port Phillip Bay. Rain shadow effects are also eveident east of the Grampians and Strzelecki Ranges as well as in valleys and basins within the Uplands. The number of rain days per year (ie. days with at least 0.2 mm rain) decreases away from the coast. Rain days total over 200 in the Otways and 150 on the west coast, but decrease to under 100 in areas where annual total rainfall is less than 500 mm. The greatest number of raindays recorded in a year is 275 at Wyelangta in the Otway Ranges, in 1986. Rainfall variability also increases significantly as distance from the sea increases and as annual totals decrease. Rainfall is most reliable in central and west Gippsland and in the southwest of the state, where the passage of cold fronts bring frequent light to moderate rainfall throughout the winter to spring months. The rainfall over East Gippsland is less reliable, with lengthy dry periods broken by relatively heavy rainfall events caused by moisture-laden low pressure systems off the NSW south coast or in eastern Bass Strait. Three-month median rainfall maps for Australia (external link) on the Bureau of Meteorology website. Three-month rainfall variability maps for Australia (external link) on the Bureau of Meteorology website.